Pack includes: Student file, three study booklets and 10 tutor marked assignments including complete SATs-type test. Classification and variation; reproduction; digestion; photosynthesis; the biosphere; respiration; mixtures; density; chemical reactions; acids and alkalis; rocks and weathering; greenhouse effect; sound and light; forces; energy and electricity; magnets and electromagnets; electrical circuits. 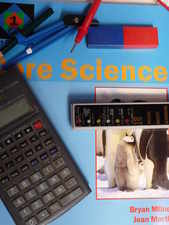 This course provides a sound background knowledge for embarking on any of our IGCSE science courses.